A brand new business venture, HeadRed’s creative team were tasked with creating a website and a brand which could compete in the car buying sector. The unique brand name Jam Jar Moolar along with a strong brand identity created a fresh and dynamic business ready to make a stand in the industry. With custom animations and a soft colour palette Jam Jar Moolars new site reflects the simple and honest approach of the business. 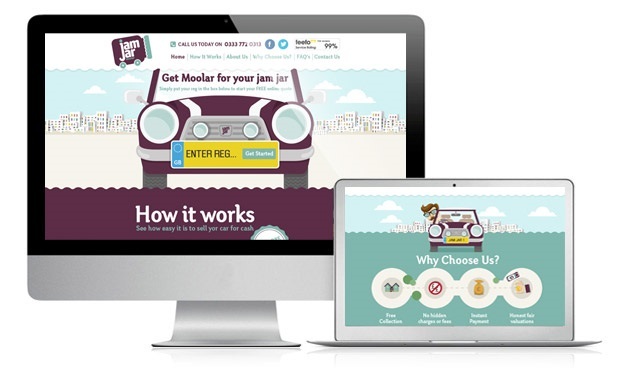 With no hidden costs or fees, fair evaluations and a highly competitive approach to get customers more moolar, Jam Jar Moolar promises to bring a more transparent car buying service which customers can trust. HeadRed developers certainly had fun creating this site; take a look at their creation by visiting www.jamjarmoolar.co.uk and let us know what you think !